Should you drink or eat your marijuana medicine? We tend to associate edibles with brownies, but they go far beyond desserts. If your state allows it, you can find plenty of infused drinks on your dispensary’s shelves. Medical cannabis beverages fall under the category of “edibles.” But, they have different properties than the medicated snacks we love. Let’s go over some factors to consider when choosing between drinks and edibles. What Are Medical Marijuana Edibles and Beverages? Cannabis edibles come in the form of food items infused with marijuana. They can contain a full marijuana extract or a single cannabinoid, like tetrahydrocannabinol (THC) or cannabidiol (CBD). You can mainly buy edibles as products like baked goods and candy. But, marijuana beverages keep growing in popularity, even to the point that Coca-Cola may produce them in the future. Holistic wellness buffs who medicate with cannabis like to juice their marijuana to get more nutrients. 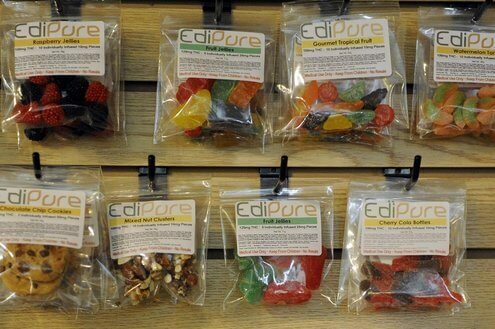 If your state allows edibles, you can find them at many dispensaries. The selection in your dispensary will depend on state laws, local brands and the location’s inventory. Like any food or drink, edibles and beverages have varied nutritional benefits. Medical dispensaries have the purpose of enhancing health, but most of their edibles have high fat and sugar levels. Unless you choose pills, you may have a limited selection of healthy options. Patients with restricted diets may have difficulty finding something they can eat or drink. The majority of edibles come as baked goods or candies, while many beverages contain caffeine or sugar. If you can only find sweet edibles and drinks, you have to weigh the risks and benefits. Foods high in fat and sugar don’t hurt most patients when eaten in moderation. But, if you only medicate with sugary products, you could cause more harm than good. We recommend using non-sugary edibles and drinks when possible, but you can also keep an eye on your intake. Patients who want to save money or can’t find the product they want sometimes make their drinks and edibles. The difficulty of starting a personal medical marijuana kitchen depends on what you create. You can add cannabis oils and tinctures directly to food and drink without extra steps. But, if all you have is flower, edible crafting becomes more labor-intensive. You need to turn it into cannabis flour or blend it into cannabutter to avoid having large pieces in your food. Due to the way the body absorbs cannabinoids, you may need to add fat to your homemade drinks. Cannabis compounds are fat-soluble, so they need to travel through your body for a while before taking effect. However, when you combine cannabinoids with fat, your body absorbs more of them — and more quickly. That’s why we recommend adding fat to cannabis tea made with flower. Gastrointestinal Uptake: Pills, food and other medications you swallow go through your digestive system. You feel their effects after quite a while, but the benefits last for much longer than the other two forms of administration. Oral Uptake: Lozenges, gum and medicines that you absorb through your mouth come into effect very fast. They go right into your system through the blood vessels in your mouth. But, they don’t last as long as medications you eat. Hybrid: Beverages and other select forms of medication absorb through your mouth and your stomach. It takes only a little while to feel them, and the effects last for a few hours. As you can see, beverages take the middle ground between fast-acting and slow-acting edibles. You need to consider how quickly and for how long you need relief before choosing one or the other. Cognitive Development or Function: Children and adult patients with certain cognitive abilities can get scared when they have to take a pill or inhaler. Meanwhile, edibles and drinks have a lower chance of intimidating them. Cooking Ability and Time: When laws or cost prevent buying edibles and drinks, you need the time and ability to make them. Not everyone has the time, energy or motor function to make these medications. Diet: Edibles and beverages don’t always fit into diets for specific conditions and lifestyles. Some patients can’t eat solids at all, so they can only choose drinks. Experience: Since edibles can take a while to provide relief, many new patients accidentally have too high of a dose. People with low THC tolerances need to take extra care when medicating with beverages and edibles. Whether beverages or edibles will work best for your treatment plan depends on your preferences and lifestyle. The main deciding factor may be the speed and length of relief — double-check the “Length of Effects” section above. Otherwise, beverages and edibles can relieve a wide range of conditions since they circulate through your system. They especially suit full-body physical conditions and certain gastrointestinal disorders. If you would like more help deciding on a medicinal product, the medical cannabis industry has experts happy to help. A marijuana-trained doctor can write you a recommendation. Some of them even offer advice on medication choice. Meanwhile, medicinal dispensary staff members know their inventories and have medical training. Discover cannabis-certified doctors in your area, or search for a dispensary near you. What Medical Marijuana Ingestion Method Works the Fastest?